Although it’s December as I write this, by the time that (most of) you will read this it will be January. We had a fantastic autumn, building on our very active summer, with three fantastic events and actions! As well as ongoing campaigning for a zero waste Brum! Saturday 5th December saw a successful Small Business Saturday event at the Library of Birmingham. This included a session on Birmingham Pound run by our friends and drivers of the Birmingham Pound project – Localise West Midlands. Hopefully, this will generate more interest to push the Birmingham Pound in 2016. We teamed up with climate campaigners from across the region to launch Divest West Midlands Pension Fund on 25th September. The action included a hand in of letters to the pension fund committee and a banner photo stunt outside Wolverhampton Council offices. Our successful funeral for fossil fuel investments was on 10th October, attended by around 30 campaigners from Birmingham Friends of the Earth, and Birmingham Green Party amongst others. Five days later we had a successful joint public meeting on international climate in Sutton Coldfield with over 50 Suttonites asking some difficult questions of Conservative MP Andrew Mitchell. On 21st November, we had some great conversations with a stall at the Quaker organised Interfaith climate exhibitions and presentations event. We also supported and participated in two lots of action on 28th November. Campaigners across the West Midlands (including Birmingham FoE campaigners) ran a Christmas Cards for Cameron action, engaging members of the public to sign Christmas cards calling for a strong climate action. 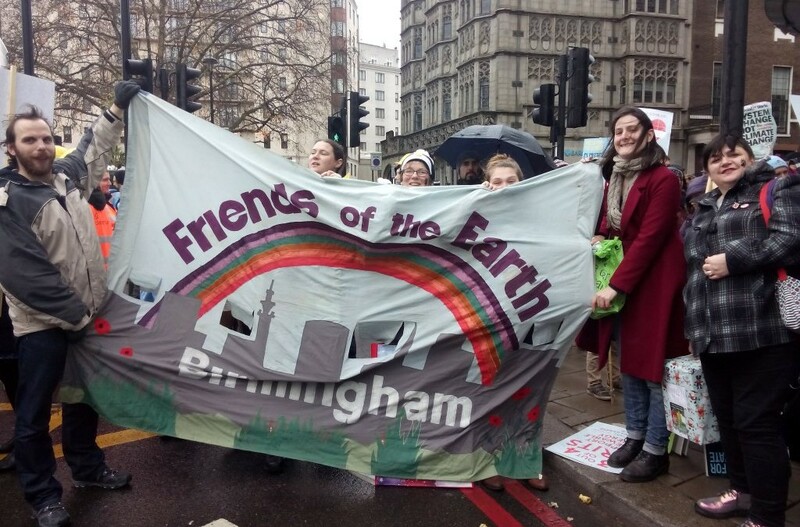 Birmingham FoE campaigners also took part in the interfaith climate walk and vigil, Footsteps: Faith for a Low-Carbon Future. On Sunday 29th, we joined 50,000 other people for the largest ever UK climate march. We took our “Birmingham Says Change the System not the Climate” banner signed by the people of Birmingham, which attracted a lot of interest. On 10th December, we teamed up with the Birmingham Cooperative Film Society for a showing of Naomi Klein’s This Changes Everything, before heading over to Paris for the Climate Mobilisation there with our signed banner. Have a read of Matthew’s, Joy’s and Roxanne’s articles about all of these fantastic events for details! We rounded off October with a great Halloween Harvest Festival in Digbeth Community Garden. This was attended by over 80 people, who had a great time celebrating urban nature with us. See Christina’s article for more details! We hope to be doing more nature stuff again in the spring. Waste Isn’t Rubbish continues apace with more stalls and the number of signatures mounting up. We’ve been talking to community groups around the city with lots showing their support for a zero waste Birmingham! We’ve also been speaking to councillors about the campaign in an attempt to build cross-party support for a zero waste city. I hear it’s the time of year for resolutions, so if you’re inspired by any of our actions and fancy supporting us, why not get involved in campaigning with us? Come along to one of our Monday meetings or get in touch via email. Alternatively, if you don’t have much time, but would like to support us financially you can donate via local giving.